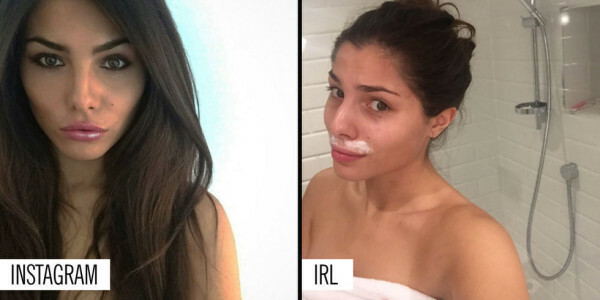 Are These Instagram Celebrities Giving Girls A New Perspective On Social Media “Fame”? 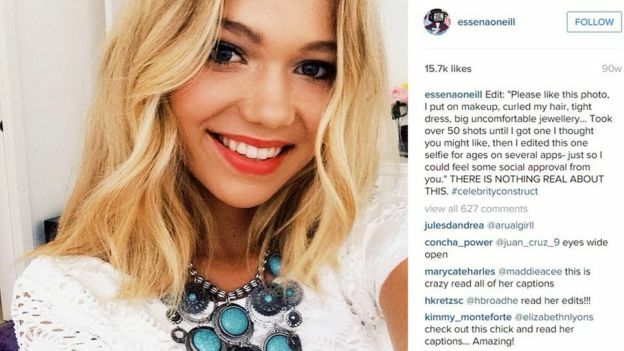 By now you are probably already familiar with Australian Instagram celebrity/model Essena O’Neill, the teen girl who famously became a viral sensation (outside of her already large following) for declaring that social media was a big fake universe that played on the insecurities of young people, especially girls. Her story was being reported on in pretty much every major online news source dedicated to pop culture, and it was shared far and wide amongst social media users. Naturally, with anything that hits big on social media, there was the expected backlash toward Essena, saying she was the problem for agreeing to push a fake message. In a bid to change the way she was operating, a teary Essena declared in a Youtube video (which has since been deleted) that she was quitting all social media, and even deleted a lot of her Instagram posts. With the ones that remained, she painstakingly re-worded every caption of her admitting how fake each pose was, that she was paid to wear the outfit, and how much food she chose not to eat in order to look skinny. It certainly got people talking, not because she did something so outrageous, but because someone finally had the guts to say what a lot of us have been thinking about social media for a long time, and someone with a huge following. 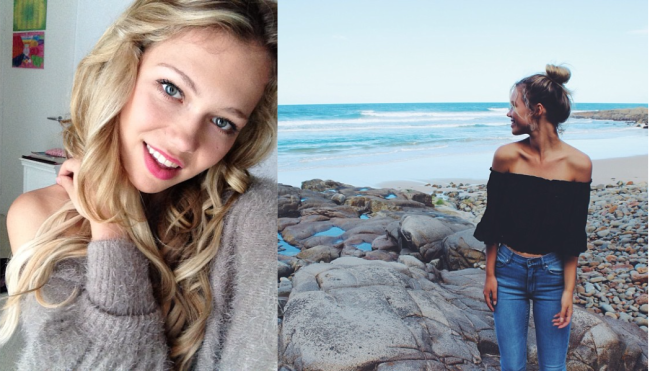 The 18 year old from Queensland, Australia, had over 600,000 followers on Instagram, which is no small feat. Some major celebrities have less than that! Those with a large social media following have become a dream marketing tool for big brands and companies that see how easy it is to pay one of these Insta-lebrities to hawk clothes, music, books, whatever to their growing base of followers as it taps into a somewhat “authentic” relationship between someone that is seen as an ordinary person and the people who follow them, as opposed to some inaccessible A-list celebrity who is too busy filming blockbuster movies or hit TV shows to spend time being a social media influencer. 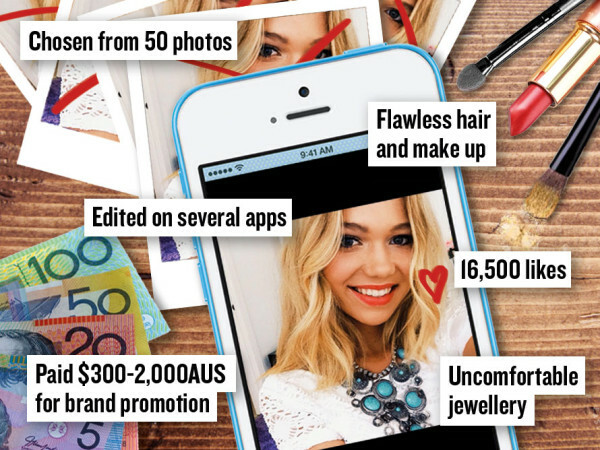 Of course, even the idea that these paid social media celebs are “authentic” has now been debunked, as we’ve seen with Essena’s candor of what she was paid to do on a daily basis. Since quitting social media, she has launched a website called Let’s Be Game Changers where she still shares videos, and exposes the process behind some of her seemingly “perfect” Instagram photos. She also uses it as a platform to focus on her passion for veganism and healthy eating. The question we have is, why did it take this long? And although we like to consider ourselves highly intelligent, aware and plugged-in individuals in a society where we can find and access anything with the click of a button, how did we manage to be so deeply duped? The more we ponder this, we realize it is just the same consumerist mentality that traditional advertising and marketing has been extremely successful with for so long, just in a different medium. Social media just happens to be the latest vehicle to push ideas of conformity, low self-esteem, self-loathing, unrealistic beauty, and body shame. The only difference is, because there aren’t PR companies engineering every Instagram post like they would with a regular million-dollar advertising campaign, these influencers can disseminate the message however they want, and it’s high time women like Essena chose to break the mold. There are many more people that have become a “thing” purely because of social media. The common trait you’ll find among women (sadly) is that a following tends to grow the more they promote their physicality. It seems like a double standard for women to feel as if posing in a sultry manner, with as little clothing as possible, is the way to achieve a large following, where as that is not necessarily the same unspoken rule for them. Once again this reinforces the message that has always been carried by traditional media and advertising that a woman’s worth comes solely from her outward appearance. 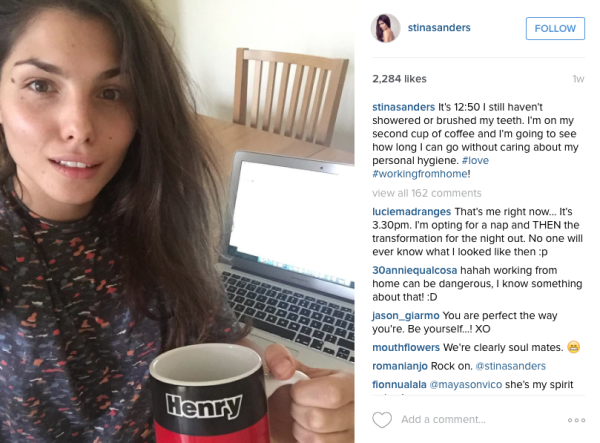 Another Instagram celebrity who has decided to jump on the bandwagon of exposing reality in social media, is UK model Stina Sanders. She currently has over 130,000 followers, which is a little lower than before she conducted an interested experiment. 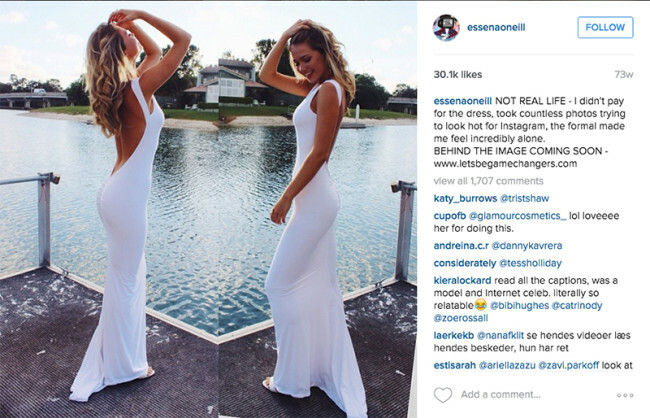 In light of Essena O’Neill’s bold statement, Stina decided that instead of posting her usual modeling pics and airbrushed images portraying some unattainable notion of perfection, she would post a series of “unglamorous” pics to show what really goes on behind the scenes of her life. Chipped nail polish, waxing her upper lip, attending a psychotherapy session for her anxiety, and selfies without makeup were among some of the more normal images posted, which as a result made her lose thousands of followers. Coincidence? “During the experiment I lost 3,000 followers and come the end, I had lost 5,000. I was shocked because I actually thought it would be the likes that would dramatically reduce and not the followers. What was interesting was I had more likes from women, whereas it is usually split, and all my comments were mostly from girls. It was evident that they wanted to reach out to me because they could relate in one way or another,” she told The Independent. She received some positive messages from women thanking her for her honesty and willingness to tell the truth, making Stina realize that social media can be used in a powerful way to spread a good message. “It’s only human nature to compare yourself to others, but this is why social media can be poisonous, especially to young girls. I’m in the modeling industry and have seen even the most beautiful women with cellulite and acne. It doesn’t stress me out but it does concern me that girls have unrealistic goals because even their idols that they look up to aren’t exactly as they seem,” she said. Not that we even need to share any expert opinions on this, but we will, because the more information we can share about this phenomenon, the more aware we can be. A recent study conducted by Florida State University and published by the International Journal of Eating Disorders found that a group of women, who were asked to browse Facebook for 20 minutes, experienced greater body dissatisfaction than those who spent 20 minutes researching rainforest cats online. Claire Mysko, an award-winning author and an internationally recognized expert on body image, leadership and media literacy, thinks they may have a point. “While social media is not the cause of low self-esteem, it has all the right elements to contribute to it. Social media creates an environment where disordered thoughts and behaviors really thrive,” she said. UConn Health’s child and adolescent psychologist Karen Steinberg-Gallucci shared her thoughts on a study released earlier this year which found approximately a half million teens in the US struggle with eating disorders or disordered eating. While she didn’t say there is a scientific link to social media causing the increase in these diseases, it is more like a common sense observation. “I think anytime there is a preoccupation with physical appearance, whether through magazines, TV, or movies, promoting unrealistic images that are unattainable for most women or girls, this creates a risk for eating disorders. The ‘selfie’ culture is another example of being excessively concerned with physical attributes to the neglect of other, more meaningful qualities about a person. There is a compulsive quality to the use of these devices and the social networks for many people,” she said. It is an important reminder to all of us that social media is a great tool in our world today, but it can also be used to perpetuate unhealthy, unrealistic, in in some cases dangerous standards. Body image is still a huge problem for young men and women and with the instant and intimate connection we now have with people form all over the world, it can play havoc on our sense of reality. 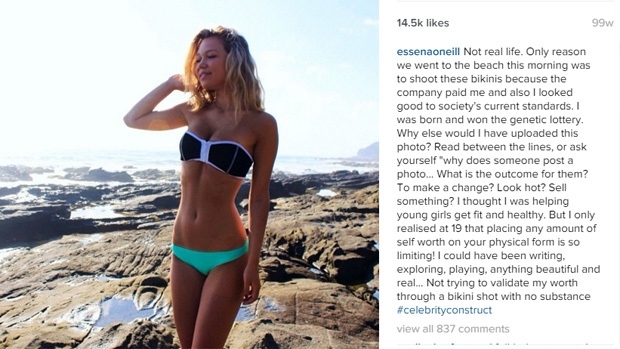 We have showcased some beautiful campaigns that have been started by women on social media wanting to fight back against the ingrained messages, such as the Love Your Lines Instagram account sharing images of women who are embracing the stretch marks on their body, and this blogger who spoke out against the way her account was censored simply for sharing an image that didn’t show a size 0 model. 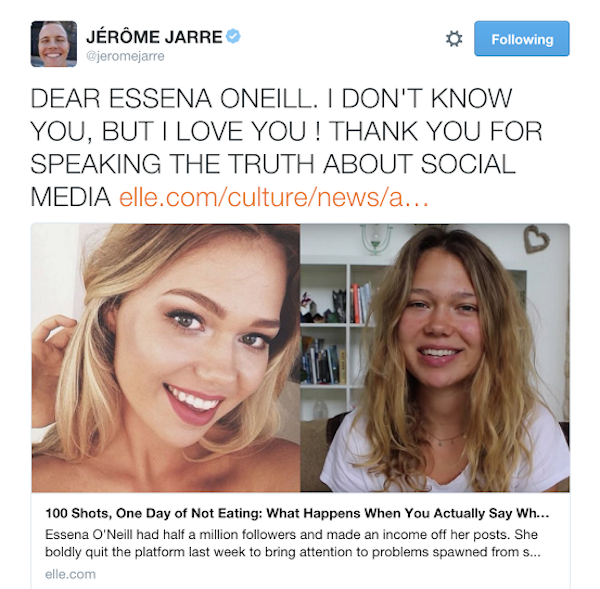 In some cases, like Essena O’Neill, quitting all social media platforms (apart from her blogsite, of course) seems like an enticing idea, and if that means you will maintain your sanity, sense of bodily confidence and reality, then go for it. If you don’t want to have to forego a popular means of communication just because there is one corner of this social media universe filled with superficiality, then we recommend finding a healthy balance, and understanding your worth comes from more than what you look like, what you post, or how many people comment or like that image. Just like numbers on a scale don’t represent what is in your heart and in your brain, numbers on a virtual platform do not determine how valuable you should be in the world. For young women especially, we have the chance to turn the negativity and use the wonderful exposure social media offers for something other than just self-promotion. Our message to all our readers today, in light of so many “trends” and viral stories that pop up every day on various social networking platforms, is to use it as a tool to challenge, enlighten, encourage, support, hold accountable, and value those in your community.